All car drivers know that a battery on their vehicle may fail at any given moment. Yes, if the warranty is still active, a battery will be replaced, but what to do until then? In early days, push-start was a valuable alternative. Nowadays, it is something almost banned. New cars, due to massive electronics inside should not be push started. This may cause severe damages to the engine! As such, a valuable alternative is jumper cables. The best jumper cable is something every single driver must have in his car. Without it starting a car when the battery is drained out isn’t even possible. Despite the fact these items are simple and compact, there are a lot of facts to know about them. And yes, there are a lot of differences, variations and etc. All of this will be better explained below. Important: All jumper cables come with two wires. One is red and another is black. It is mandatory to know that the red one is used to connect positive ports between the batteries, while the black one is used for negative one. You must remember that if you make a mistake here, you can cause damage to the battery or car electrical installation. The best jumper cables are heavy-duty ones. They simply provide the longest list of benefits and they are the most durable of them all, making them suitable for drivers who want the mentioned reliability and security. At the same time, this means that low-end jumper cables are not a great choice. First of all, they are unable to transfer the needed voltage for a car to start the engine, so they are practically useless! Sadly, there are so many, additional issues which are problematic. Due to the just mentioned reasons, we will stay focused on heavy-duty jumper cables. Simply said, they are the safest option and they offer the most benefits. In addition, they don’t have any side effects whatsoever. Let’s have a look at those benefits. One of the most important benefits is the one where a car driver only has to connect two jumper cables with a charged battery and start the engine. There is no need to remove the old battery, to make any adjustments or etc. Yes, there are other alternatives which allow you to start a car with a failed battery, but they are more than just expensive. Jumper cables are the most affordable of them all. Jumper cables come in small packages so they don’t require a lot of space. As a matter of fact, they can be placed in a glove box of a car. Any other alternative for the same purpose requires more space. One of the most annoying things when it comes to jumper cables is its length. When they are too short, they are useless. You will have to pair two cars, open the hoods and then realize a jumper cable won’t reach. This is the most common issues with low-end units! Heavy-duty jumper cables are 12-feet in length. This allows for them to be easily used at any given moment, in any situation and even when space around a car with failed battery is an issue. Heavy-duty jumper cables have a low gauge number, usually around 4. Lower the number, faster the engine start and battery charging will be. Amperes are defined as the movement of the electrons through a conductor. The more, the merrier. In plain words, this means that a heavy-duty jumper cable will allow for a higher number of electrons to pass through it, meaning that a car will get needed amount of electricity to start the engine. All cars require a massive amount of current, so we should add that this is the main benefit of them all. Interesting: Cheap jumper cables usually have a poor amount of allowed current transfer, making them useless and also prone to overheating. Energy flow generates heat. If we know that jumper cables must withstand massive energy flows, we should deduce that they will generate a lot of heat. This heat will damage them and eventually destroy them. A proper heat insulation can make a major difference. Due to the simplicity these products have, they can be used for any vehicle, any type of a battery and any related purpose. Basically, they transfer electricity only, so they can be used for all battery/vehicle types. In essence, jumper cables are something that should be owned, because when the battery fails, which is just a matter of time, these tools will be the only thing which can help you get home. Some of you may believe that the best jumper cable is the one closest to you on a shelf in a store. Others may believe that all of them are the same. These are mistakes! Regardless of the fact these are simple products, they come with a variety of important features and factors to consider. Spend some time in checking out the main factors to consider below. Gauge stands for the thickness of the wires. But there is a trick here. The lower the number, thicker the wire will be. Thicker wires allow for a higher amount or current to pass through them, meaning that jumper cables will be better and more useful. They vary between 1 and 12, but most models reach 1-4 mark. This factor is closely related to the first one. It represents amperage a cable can transfer. Usually, they range between 200 and 800 amps and this is sufficient for most car drivers. Yes, there are jumper cables with higher values, but they are reserved for buses, trucks and etc. Long jumper cables are far more desirable and much better alternative. There are countless variations here, but at the end of a day, you should choose the longest ones. An average driver will need around 20 feet of jumper cables. They will allow the drivers to use them in any situation and at any given moment. 25 feet units are slightly better and more practical. Avoid getting too short jumper cables, due to the fact they may be useless when you need them the most! Where will you place your jumper cables? If you just leave them in a truck, they will get all messy, so when the time is right to use them, you will need half an hour to make them useful. That’s why cases or bags are mandatory. Cases are more desirable because they offer better protection for the cables. Bags are simpler and more affordable version. Anyway, one of these two alternatives should be chosen. Warranty is needed for two reasons. The first one is safety knowing that your jumper cable will last for years. A longer the warranty, the better the cable will be, period. Expect to encounter warranties between 3 and 5 years. Of course, if used properly, they will last much longer. Weight will vary according to the length, gauge, and even clamps. If this isn’t the factor important for you, skip it. If it is, make sure to find a balance between the length and the wire thickness. For motorcyclists, shorter and cables with thinner wires are lighter, therefore they are more desirable. The factor stands for the flexibility a jumper cable will have at low temperatures. It is a well-known fact that all car batteries will fail when temperatures are low, therefore you will use jumper cables when the temperature is low. Heavy-duty cables can stay fully flexible even when the temperature is -40 degrees Celsius. This factor is actually determined by the design of the clamps. Those round ones are suitable for all types of battery posts. In general, all jumper cables can be used for both post types, but some are easier and some more complicated to use. Make sure you check the type of a battery on your car and choose a jumper cable accordingly. Clamps are the next main thing when it comes to jumper cables. They must be strong, but at the same time easy to open. These clamps are known as alligator clamps and they have massive teeth on both edges in order to grab the battery ports as tight as possible. The main thing to consider is the insulation. Some of them are insulated 100% while others are 50%. The first alternative is better simply because it is safer, but other works well as well. In addition, when clamps are completely insulated, they eliminate risk of sparks. The factor here stands for the main material of the jumper cables. They may be made from Copper Clad Aluminum or Copper coated Aluminum, which is almost the same thing. It is important to know that these materials are highly desirable. They are the most durable and offer the best energy flow. Yes, there are other versions as well, but they are not as great as the first two alternatives we have mentioned. Accessories include gloves, emergency escape tool or something similar. They are not essential for jumper cables, but they are desirable. This matter cannot be generalized. Each brand and each product nowadays comes with a unique set of accessories. It is nice to have them, but not necessary. Do you still believe that jumper cables are simple and all are the same? Of course not. The best jumper cable will be safe to use, durable, come with a long warranty and still be affordable. Of course, long length is a desirable factor which can make a true difference. Now is the time to present 5 best models which are safe-buy. This is the best jumper cable all of you can find today. There are several versions of it, including different lengths (16, 20, 25 and 30 feet), a version with quick release clamps and etc. The version we have tested is the best value for money. 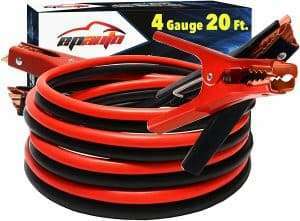 It is 25 feet long, it has great clamps and it is specifically developed for car drivers who want strong and reliable jumper cables. There are no surprises here. Both cables are tough, thick and durable. Let’s just add that the gauge number is 1, or the best value in the industry. The main material here is Copper Clad Aluminum. If you recall, we mentioned that it is the best option. Then we have the advantage when it comes to low temperatures. These jumper cables will be fully flexible even when the temperature is -40 degrees Celsius. Design of the clamps is suitable for uses on side and top battery posts. The next main thing to remember is on the amperage supported. It is 800 amp, so it is sufficient for average users and those who may need something extra. In a nutshell, these jumper cables are not something extraordinary, but they are all what they should do. They are strong, reliable and they will get job done regardless of the temperature and other factors. In a single word, they are professional jumper cables. 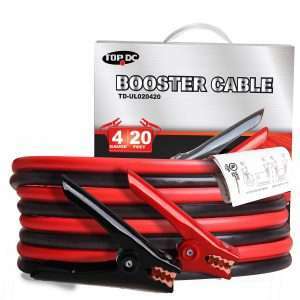 If you are looking for the next best jumper cable this one here is a wise decision. While the first one was developed for heavy-duty use, these ones are more focused on average users. As such, they have a lot to offer. First if all, the gauge value is 1, which is impressive. Then we have the advantage which comes with the package. These jumper cables come with gloves and with a bag. Both are well-made and durable components. Specifications are above average as well. You get 800 amp capacity and 25 feet in length. So, why these jumper cables are an interesting choice? They are well-made and strong, which is obvious. This makes them extremely durable and allows for the users to use them at any given moment. Then we have a price, which is more than just affordable and have a nice package, where even gloves are included. Let’s just add that the case is strong and tough, therefore jumper cables are protected at all times. Clamps are interesting. Basically, this type of alligator clamps is the easiest of them all to use. However, they are not entirely insulated, meaning that you must be careful when you are placing or removing them. On the other hand, they will fit any type of battery port perfectly. Are you looking for the most affordable jumper cables of them all? Then this product is just perfect for you. Yes, the gauge value is 4, but the thickness and the performances are actually better than with equivalent models. It means that the capacity is 400 amp, sufficient for all vehicles starting from cars and reaching even monster trucks. The length is 25 feet, but a shorter, 15-foot versions is available as well. It is obviously even more affordable. Some of the main advantages regarding this unit are the weight, which is 4.5 pounds only and the warranty, which is impressive, 10 years. At this moment, this is one of the longest warranties you will get with a new set of jumper cables. If you are looking for something else, we will add the fact the clamps are special. They require very little pressure to be opened and they are convenient regardless of the type of the battery’s post. In addition, they are heavily insulated, so the risk of creating an accidental spark doesn’t even exist. The bottom line here is the fact you are going to be more than just satisfied. After all, you will be a proud owner of a new set of jumper cables, made to last and to withstand anything you have in mind. Warranty is exceptional and the clamps are some of the best we have tested. 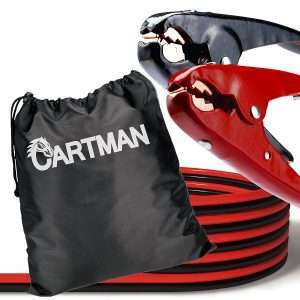 The Cartman Heavy Duty Booster Cables Jump Cable will make your life much easier when the battery is drained out. It all begins with a gauge value of 4. But, these cables are based on the latest technology, therefore the overall efficiency is 50% better than on equivalent jumper cables. 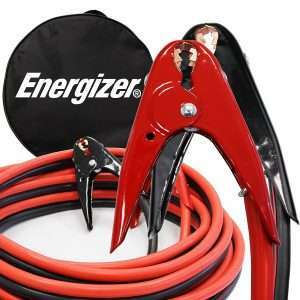 The main material is the Copper coated Aluminum and it is paired with great clamps and high-quality cables. In essence, you get all a jumper cable should provide. The capacity is 600 amp. This value is commonly known as the best spot. It means that the cables are not too heavy or too thick to handle, but they still provide exceptional results. And yes, they can be used for cars, motorcycles, ATVs and even trucks. Basically, they are sufficient for all types of users. We liked the fact value for this advantage is still well-balanced. Yes, there are a lot of additional facts you should know regarding this unit. They will stay 100% operational even at -25 degrees Celsius and the bag included in the package is actually slightly better than on other models. It is easy to use and it is spacious. 20-feet of length is just right as well. But, the main advantage is clamps. The design makes them easy to use and safe. Cables are connected deeply into the clamps so the risk of sparks is low. This design also makes the connection between the cables and the clamps much stronger. When it comes to the price, they are affordable. Keep in mind that only one version is available and only a bag is included in the package. There are no other accessories. The gauge number is 4, the length is 20 feet and the style is heavy-duty. Basically, these cables are all you are going to need in a long time. They are strong and durable, while the price is still low. So yes, you will be satisfied with these jumper cables. They are made from strong and heavy-duty materials, so it is possible to use them when temperatures are low or high. As a matter of fact, we tested the cables on a temperature -40 degrees Celsius and they were 100% operational. The main material for the cables was the Copper Clad Aluminum. The clamps are state of the art. They are among some the strongest, yet the easiest to operate with. In addition, the design makes them suitable for use on all vehicles, starting from motorcycles and reaching trucks. 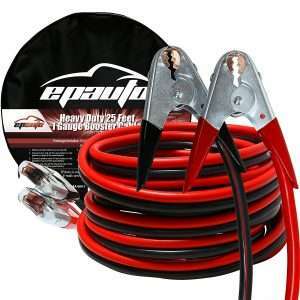 It is a nice thing being able to use these jumper cables whenever you want, for any vehicles that need juice. The best jumper cable doesn’t have to look pretty. It must be fully operational when you need it because when you do, it means that you are trapped in your stationary car! All 5 models from the list are strong, durable and reliable. They will definitely help you when you need them regardless of any issue, type of vehicle or something else. In other words, they will get your car going once again.